Kō shōgi (廣将棋 or 廣象棋 'broad chess') is a large-board variant of shogi, or Japanese chess. The game dates back to the turn of the 18th century and is based on xiangqi and go as well as shogi. Credit for its invention has been given to Confucian scholar Ogyū Sorai. Unlike standard shogi, pieces may not be dropped back into play after being captured. Promotion rules are complex, and the fates of several pieces are interdependent. The objective is to capture the opponent's commanding pieces: The general, plus, if present, the governor; otherwise, the banner or middle army. 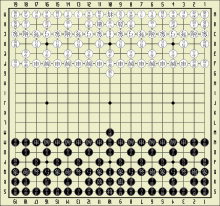 Two players, Black and White, play on a go board ruled into a grid of 19 ranks (rows) by 19 files (columns) with a total of 361 intersections. Each player has a set of 90 pieces of 34 different types. The pieces are round and flattened like go stones. In all, the players must remember 65 different moves. The pieces are generally of the same size, though black pieces may be slightly larger than white pieces. Each piece has its name in the form of one or two Japanese characters marked on its face, in white on black stones and in black on white stones. On the reverse side of most pieces are other characters in red; this side is turned up to indicate that the piece has been promoted during play. Listed below are the pieces of the game and, if they promote, which pieces they promote to. *Pieces marked with asterisks are not found at setup, and only appear with promotion. Many of the translations into English are suggestions only. Below is a diagram showing the setup of one player's pieces. The pieces are placed on the intersecting lines of the board and not in the squares. The way one player sees their own pieces is the same way the opposing player will see their own pieces. The players alternate making a move, with Black moving first. A move consists of moving a piece on the board and potentially capturing a piece or pieces and promoting a piece or pieces. Each of these options is detailed below. An opposing piece is generally captured by displacement: That is, if a piece moves to an intersection occupied by an opposing piece, the opposing piece is displaced and removed from the board. A piece cannot move to an intersection occupied by a friendly piece (that is, a piece controlled by the same player). However, some shooting pieces are unable to capture by displacement, and therefore cannot move to an intersection occupied by an opposing piece. Many pieces are capable of several kinds of movement, with the type of movement usually depending on the direction in which they move. The most common kinds of moves are step, range, shoot, and jump. The step movers at the beginning of the game are the general, aide de camp, aide, staff, chief of staff, engineer, middle troop, drum, banner, sentry, European cannon, long bow, crossbow, shield, and pawn. Some pieces can move along a limited number of free intersections along a straight line. Other than the limited distance, they move like range pieces (see below). The limited range pieces at the beginning of the game are the chariot and the vanguard. Several pieces can jump, that is, they can pass over an intervening piece, whether friend or foe. At the beginning of the game these are the clerk, staff officer, highway, spiritual monk, and cavalryman. Many pieces can move any number of free intersections along a straight line, limited by the edge of the board. If an opponent's piece intervenes, it may be captured by moving to that intersection, and removing it from the board. A range piece must stop where it captures, and cannot bypass a piece in its way. If a friendly piece intervenes, the moving piece is limited to a distance that stops short of the intervening piece; if the friendly piece is adjacent, it cannot move in that direction at all. The range pieces at the beginning of the game are the advance guard, millenary, quartermaster, centuria, rear guard, elephant, patrol unit, shield unit, and chariot unit. Some pieces can shoot, that is, they can remove a piece from the board a limited distance from their location. Except for the cannon, they cannot shoot an enemy piece if another piece stands between the shooter and its target. The cannon, however, can shoot over such intervening pieces. It is not clear if a piece must move in order to shoot. The shooting pieces are the highway, spiritual monk, European cannon, long bow, crossbow, and cannon. Wherever a burning piece arrives at an intersection, all adjacent enemy pieces are removed from the board, as described below. The only burning piece is the poison flame, which only appears with promotion. The sumo wrestler and cavalry have double-move with double-capture abilities, similar to the 'lion move' in chu shogi. Unlike the lion, they are merely double-move pieces and do not have the ability to bypass a friendly piece occupying the first landing point. Unless stated otherwise below, the multiple moves do not need to be in the same direction and need not all be taken. A second or later move may return a piece to its starting location. Among the promoted pieces, the master at arms, banner and drums, twelve-mile fog, thunderclap, roaming assault, dragon ascending, tiger wing, war hawk, and winged horse have multiple-capture abilities. The European cannon has a double-kill ability when it shoots. In the diagrams below, the different types of moves are coded by symbol and by color: Blue for step moves, green for multiple capture, red for range moves, and yellow for jumps. * Jumps directly to this square and stops, bypassing any intervening piece, but may not capture with this move. ☆ Jumps directly to this square and stops, bypassing any intervening piece, and may capture. · Steps a limited number of squares along a straight line, but may not capture with this move. ○ Steps a limited number of squares along a straight line, and may capture. Must stop upon capture. ○ Steps a limited number of squares along a straight line, capturing more than once. ● Steps a limited number of squares within an area, changing direction and capturing more than once. ╋ Steps a fixed number of squares within an area, changing direction and capturing more than once; cannot stop until range is exhausted. ☆ Jumps a limited number of times to this square; square may also be reachable with an areal step. │ Ranges along a straight line, crossing any number of empty squares. Must stop upon capture.
! Shoots the nearest piece in this direction (capture without moving). !! Shoots twice in this direction (double capture without moving). * Cannon shot at one of these squares, bypassing any intervening piece (capture without moving). ※ Burns all adjacent enemy pieces wherever it stops. Pieces are arranged in this section so that, if they promote, the promoted version is to the right. Piece names with a grey background are present at the start of the game; those with a blue background only appear with promotion. Abbreviations of Kanji names are not official, but for the sake of Layout. Betza's funny notation has been included in brackets for easier reference, with the extension that the letter d indicates doublemove pieces, dh indicates limited doublemove pieces (doublemove pieces that must continue on the same path they started on, moving either forwards or backwards) and dd indicates doublemove pieces that must stop once they capture. dn represents pieces that may move n times per turn, dhn indicates limited n-move pieces, and ddn indicates single-capture n-move pieces. x (for shooting, the equivalent of igui in Western chess variants) denotes igui power without the power to move to the igui squares, and xn denotes the ability to perform igui (shoot) n times per turn. pp indicates cannon-like pieces that can jump an unlimited number of pieces, and pn indicates cannon-like pieces that can only jump n pieces. General 将 shō The General does not promote. Step: The clerk can step one intersection in one of the four diagonal directions. This is the move of the kirin in other shogi variants. This is like a double kirin move in chu shogi and other shogi variants. Step: The staff officer can step one intersection in one of the four orthogonal directions. This is the move of the phoenix in other shogi variants. This is like a double phoenix move in other shogi variants. This is equivalent to the drunk elephant in other shogi variants. However, it does not promote to a prince. This is the move of the dragon king in other shogi variants. Area move with double capture: The sumo wrestler can move in one turn as a general does in two. That is, it steps one intersection in any direction once or twice, potentially capturing two pieces per turn. By changing directions after its first step, it can reach the intersections that a knight jumps to in Western chess. By moving back to its starting intersection, it can effectively capture a piece on an adjacent intersection without moving. This is called 居喰い igui "stationary feeding". The sumo wrestler cannot jump over an intervening friendly piece as a "lion" can in other shogi variants. This is the move of the gold general in other shogi variants. Range: The town brigade can move any number of free intersections directly forward or backward. This is the move of the flying stag in chu shogi. This is the move of the silver general in other shogi variants. Range: The village brigade can move any number of free intersections directly to either side. This is the move of the ferocious leopard in other shogi variants. This is the move of the free silver in other shogi variants. This is the move of the copper general in other shogi variants. It is not clear what happens when two opposing poison flames meet. Nor what happens if any other opposing piece lands next to a poison flame. See the fire demon in tenjiku shogi for some possibilities. Jump: The Taoist priest and spiritual monk can jump to the second intersection in any direction, orthogonal or diagonal. However, they can only capture an enemy priest or monk with such a jump. These two pieces move and promote the same, but only the loss of the priest prevents or reverts promotion of the banner and drum. If a twelve-mile fog and immaculate light ever find themselves within 5 intersections of each other, the fog immediately reverts to a Taoist priest. The fog cannot be shot from within a distance of five intersections. It can only be shot (by the European cannon 佛狼機) from a distance of six intersections or more. Range: The advance guard can move any number of free intersections directly forward. This piece promotes if its clerk promotes. Range: The heaven's vengeance can move any number of free intersections along either of the forward diagonals, or directly to either side. The governor functions as a second general. If the drum is killed, the pawns may no longer move forward. Areal quintuple move: The thunderclap steps five times per turn in an orthogonal direction, with the choice of changing directions after each step, potentially capturing up to five pieces. If the allied priest 高道 is killed, the thunderclap reverts to a drum. Limited-range quintuple move: The roaming assault can step up to five times per turn in any one orthogonal direction, potentially capturing up to five pieces. If the allied priest 高道 is killed, the roaming assault reverts to a banner. This is the move of the blind tiger in other shogi variants. This is the move of the dragon horse in other shogi variants. This is the move of the free king in other shogi variants. The dragon arising adds the moves of the sumo wrestler 力士 to those of the millenary. Range: It can move any number of free intersections along any of the eight directions. !! !! !! !! !! !! !! 佛 !! !! !! !! !! !! !! Step: The European cannon can move one intersection in one of the four diagonal directions. It cannot capture by making such a move. Double shot: It can shoot two enemy pieces up to 7 free intersections from its landing point in any of the eight prime directions. It may shoot in different directions, or it may shoot one piece, and then shoot a second piece that had been blocked by the first. !! !! !! !! !! !! !! 神 !! !! !! !! !! !! !! Limited range: The chariot of the gods can move up to five free intersections along one of the four orthogonal directions. However, it cannot capture this way (that is, by displacement). This is the move of the bishop in other shogi variants.
! ! ! 弓 ! ! ! Step: The long bow can move one intersection in one of the four diagonal directions. It cannot capture by making such a move. It cannot shoot an imperial base 天塁, shield 牌, shield unit 牌総, chariot 車, chariot unit 車総, gun carriage 砲車, or twelve-mile fog 五里霧.
! ! ! 廣 ! ! ! The long bow cavalryman combines the move of the cavalryman with the attack of the long bow. Jump: It can jump as a cavalryman to any of its eight destinations. However, it cannot capture a piece this way.
! ! ! ! ! 弩 ! ! ! ! ! The crossbow cavalryman combines the move of the cavalryman with the attack of the crossbow. Step: The cannon can move one intersection in one of the four diagonal directions. It cannot capture by making such a move. It cannot shoot an imperial base 天塁, shield unit 牌総, or twelve-mile fog 五里霧. Shot: It can shoot as a cannon: One enemy piece up to five intersections away from its arrival point in any of the eight prime directions. Like a cannon, it can shoot over intervening pieces. The gun carriage cannot shoot an imperial base. This is the move of the knight in Western chess. The cavalryman promotes if it captures a European cannon. Double jump with double capture: The cavalry jumps once or twice as a cavalryman in a single turn, potentially capturing two pieces. This is the move of the angry boar in other shogi variants. This is the move of the vertical mover in other shogi variants. This is the move of the flying ox in chu shogi. The shield is unaffected by the bows (弓,弩). This is the move of the cat sword in dai shogi. Range: The shield unit can move any number of free intersections orthogonally to either side. The shield unit is unaffected by the bows (弓,弩) or the guns (砲,佛狼機). This is the move of the free boar in chu shogi. The imperial base cannot be shot by the long bow 弓, crossbow 弩, cannon 砲, gun carriage 砲車, European cannon 佛狼機, or chariot of the gods 神機車, nor can it be killed by the chariot 車 or chariot unit 車総. It cannot capture the imperial base 天塁. The chariot unit is unaffected by the bows (弓,弩). This is the move of the rook in other chess variants. This is the move of the rook in other shogi variants. This is the move of the free king in other shogi variants..
Ko shogi has the most complex promotion rules of any shogi variant. A player's promotion zone is the enemy camp, consisting of the six farthest ranks that comprise the opponent's territory at setup (the original line of the opponent's chariots and beyond). If a piece moves within this promotion zone, including moves into, out of, or wholly within the zone, then that player may promote the piece at the end of the turn. (The general, sumo wrestler, and elephant do not promote, nor do pieces which have already promoted.) Promotion has the effect of changing how a piece moves. See the table above for what each piece promotes to. Promotion is effected by turning the piece over, revealing the name of its promoted rank. A piece that captures a commanding piece (the general 将, governor 帥, middle troop 中軍, or banner 旗) promotes on the spot. A step mover (that is, a piece which can only move one step at a time) which captures a sumo wrestler 力士, dragon ascending 龍驤, roaming assault 招揺, or thunderclap 霹靂, promotes on the spot. The cavalryman 馬兵 promotes if it captures a European cannon 佛狼機. When the clerk 記室 promotes to master at arms 軍師, the allied advance and rear guards 前衛, 後衛 promote as well, while any enemy poison flame 毒火 dies. However, while the clerk promotes as usual upon capturing a commanding piece, it cannot promote by entering or moving within the promotion zone unless the advance and rear guards have already entered the zone. If the Taoist priest 高道 is captured, the drum 鼓 and banner 旗 can no longer promote, and if either or both have already promoted (to roaming assault 招揺 or thunderclap 霹靂), then they immediately revert to drum or banner. Whenever the immaculate light 聖燈 is within 5 intersections of the twelve-mile fog 五里霧 along one of the eight prime directions, the fog reverts back to a Taoist priest 高道. Many pieces only appear as a result of promotion. They are marked with a blue background in the movement diagrams above. Unlike Western chess, a player need not move out of check, and indeed may even move into check. Although obviously not often a good idea, a player with more than one commanding piece (general or governor) may occasionally sacrifice one of these pieces as part of a gambit. A player who captures the opponent's general 将 and either the middle troop 中軍 or the banner 旗 wins the game. However, if the opponent's middle troop has promoted to governor 帥, and the player captures the general and banner, then the governor takes command in place of the general and the game continues until it too is captured. That is, a player can continue the game with either the general, or the governor, or with both the middle troop and the banner together. In practice the final capture rarely happens, as a player will resign when checkmated, as otherwise when loss is inevitable. The method used in English-language texts to express shogi moves was established by George Hodges in 1976. It is derived from the algebraic notation used for chess, but differs in several respects. Modifications have been made for kō shogi. If a piece captures by 'igui’ (possibilities are the sumo wrestler, dragon ascending, tiger wing, cavalry, winged horse, twelve-mile fog, immaculate light, banner and drums, or master at arms), the intersection of the piece being captured is used instead of the destination intersection, and it is preceded by the symbol '!'. If a second or later capture is made, then it is added after the preceding capture. If a move entitles the player to promote the piece, then a + is added to the end to signify that the promotion was taken, or an = to indicate that it was declined. For example, MAx7c= indicates a middle troop capturing on 7c without promoting. In cases where the above notation would be ambiguous as to which piece is meant, the designation of the starting intersection is added after the designation for the piece.